A band who 'sound like Edith Piaf on bath salts' Sinner Sinners play loud, powerful and unapologetic rock and roll with a calm humility that belies the crazed power that lies beneath. Unpretentious, yet dedicated to their craft Sinner Sinners get what it means to rock, sure their music may be more extreme than many other rock and rollers but really they're just doing it in the spirit of the genre, as musical children of Lemmy these guys (Well namely a husband and wife) blare through their new EP Excuse our French with a ferocious rock and roll energy that can not be matched. 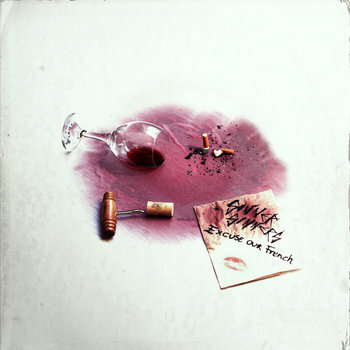 One of the best things about Excuse our French is the way this record charges ahead recklessly with no respect for its surroundings. Sinner Sinners capture all of the magic of the craziest rock and roll bands and distill it into a mere three songs. The only contemporary group that I could at all compare them to is Kvelertak, but even then, these guys are very different in their approach to what is still essentially Chuck Berry's music. Few bands can rock the way Sinner Sinners do and their sheer blasting power is certainly something to be reckoned with. In conclusion, if you're looking for a hard hitting rock and roll band who get the magic of the genre with every blaring chord then Sinner Sinners is the band for you. Sure these guys don't play by the rules or really do anything they are supposed to but by god do they bleed rock and roll. More extreme than their predecessors and with a loud and proud message of rebellion these guys prove that rock music isn't dead. If you're looking for hope in this downcast world and need a noisy and brash record to bring you up then check out Excuse our French!